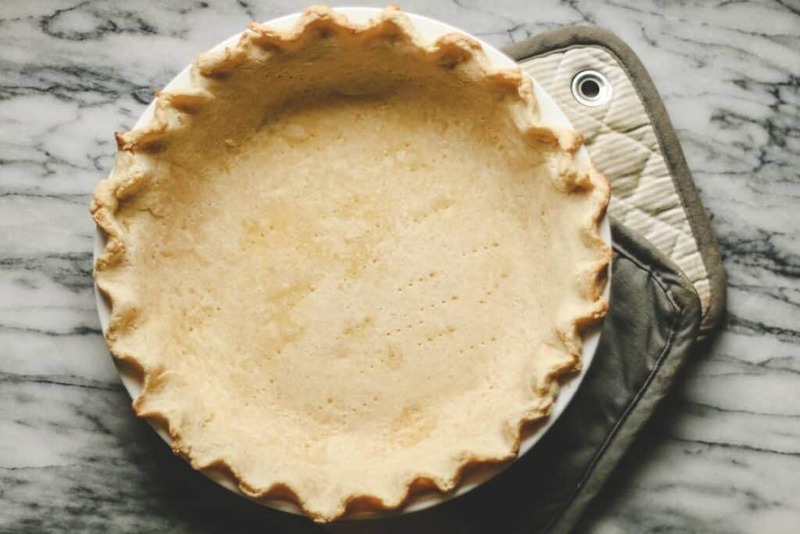 Making a homemade gluten-free pie crust can be tricky! Lucky for you, I’ve got you covered with this easy, no-fail recipe! I’ve been trying to master a gluten-free pie crust for couple of months now and I’ve gone through an embarrassing amount of butter in the process! As you know, butter ain’t cheap! In the quest for a pie dough that worked, I tried everything from converting old recipes to trying so many other blogger’s recipes… they all failed! I was about to give up, forget pie forever, and sulk in gluten-free self-pity. Then I thought, no. Not today, pie. 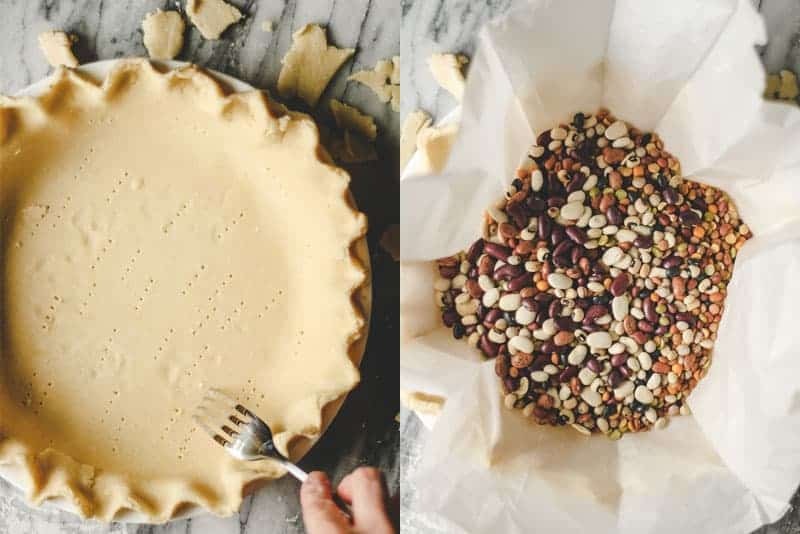 It’s my mission to master gluten-free pie crust before Thanksgiving! In a last ditch effort, I went on King Arthur Flour’s website and found one last recipe to try. The recipe was actually pretty close to one of my old recipes, which gave me a glimmer of hope that it would work. Well, guess what? It did! Finally an easy, no-fail recipe! The key that I was missing was adding Xanthan Gum. My flour blends already contained either xanthan or guar gum but the dough needed a little more to prevent it from crumbling apart. I used cornstarch, instead of the Instant ClearJell the recipe called for, and everything turned out beautifully! 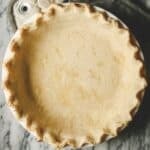 You can use this Gluten-free Pie Crust recipe for all of your favorite pie recipes… apple, pumpkin, or custard! I’m going to be making Pumpkin Pecan Pie with this crust for sure! This recipe would also work for savory pies, like quiche or pot pie, just omit the sugar. It makes enough for one 9-inch pie crust, regular or deep-dish. Double the recipe if needed for a double-crust pie. Gluten-free Flour: I used Pamela’s All-purpose Gluten Free Flour and got great results! It is a rice flour based blend. Xanthan Gum: A gluten-free pantry staple. 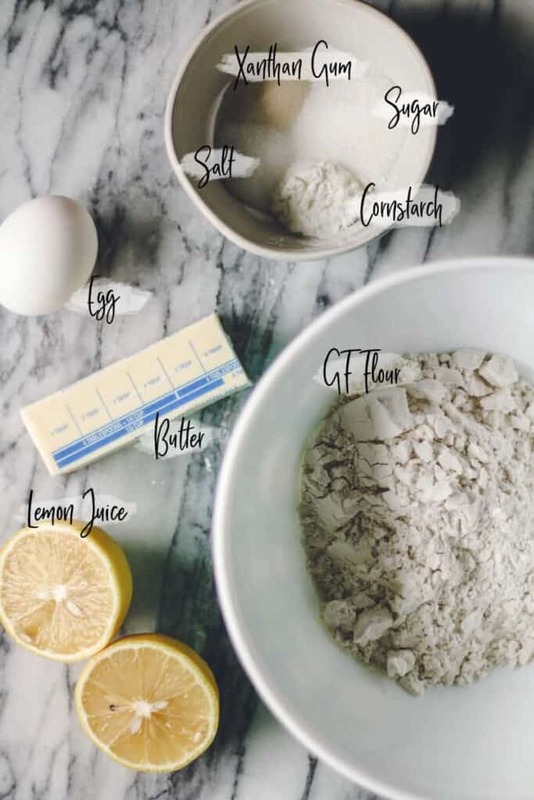 If you struggle with crumbly pie dough, adding a little xanthan gum can help, even if your flour blend already has a gum in it. Butter & an egg: Make sure it’s cold. Sugar, Salt, & Cornstarch: the cornstarch also helps in keeping the dough pliable. 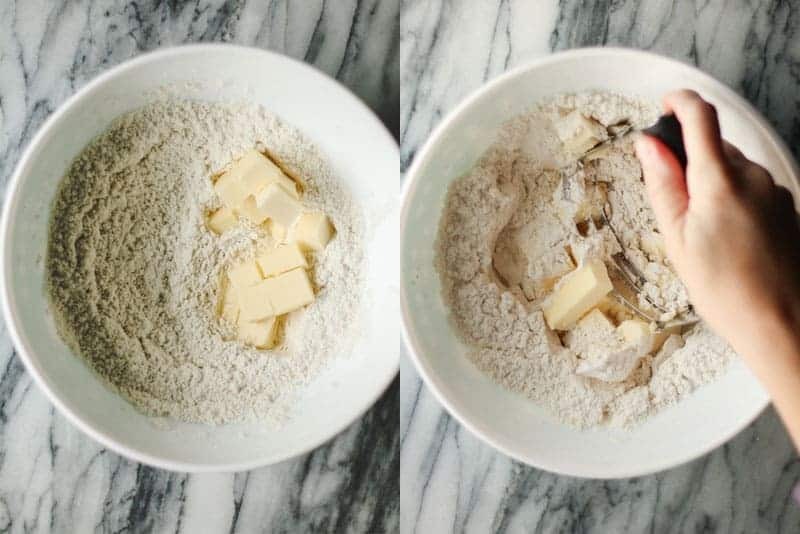 Fist, whisk the dry ingredients together in a large bowl. Then cut in the butter. Whisk the egg and lemon juice together. Pour that into the flour mixture and stir well to combine, really working it through to get it evenly mixed. Add ice cold water 1 Tablespoon at a time, stirring until the mixture comes together. See below how it holds together when squeezed? It’s ready to form a ball! At this point wrap the dough tightly with plastic wrap and refrigerate for at least 1 hour or overnight. Allow 15 min to soften before rolling. You can also use the dough right away if needed. Now it’s time to roll it out the dough. Sprinkle your surface and rolling pin with GF flour. 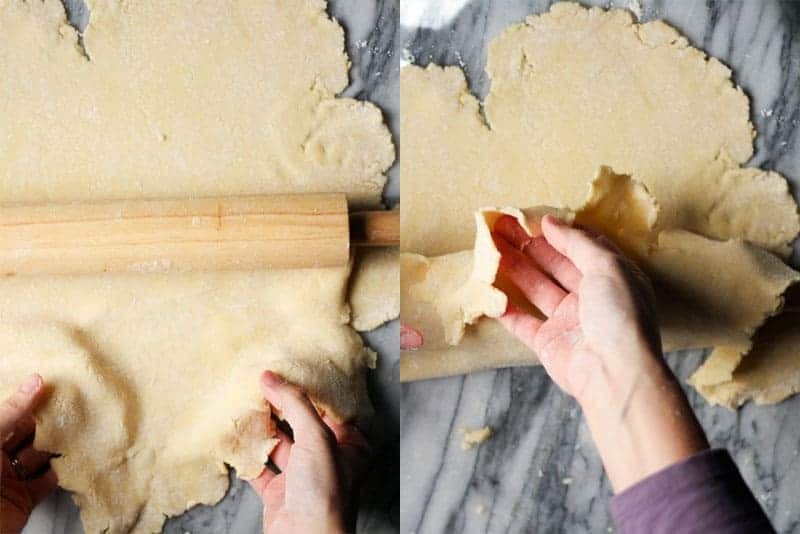 Roll out the dough with a rolling pin. The secret is to keep moving the pastry around to make sure it isn’t sticking. If it starts to stick, add more flour on so it doesn’t stick to your counter or rolling pin. Once it’s rolled out, it’s time to get it in your pie pan. 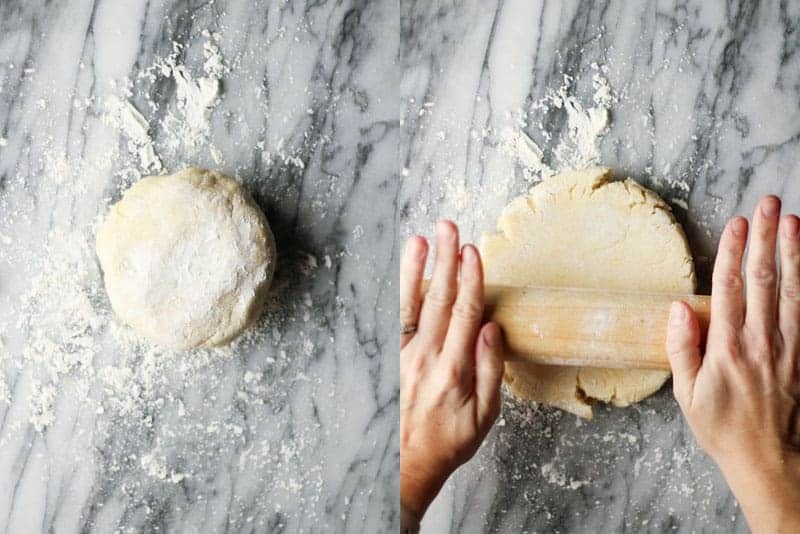 To do this, place your rolling pin in the center of the dough. Then, gently drape the dough over the pin. Place your pie plate right next to the rolling pin. 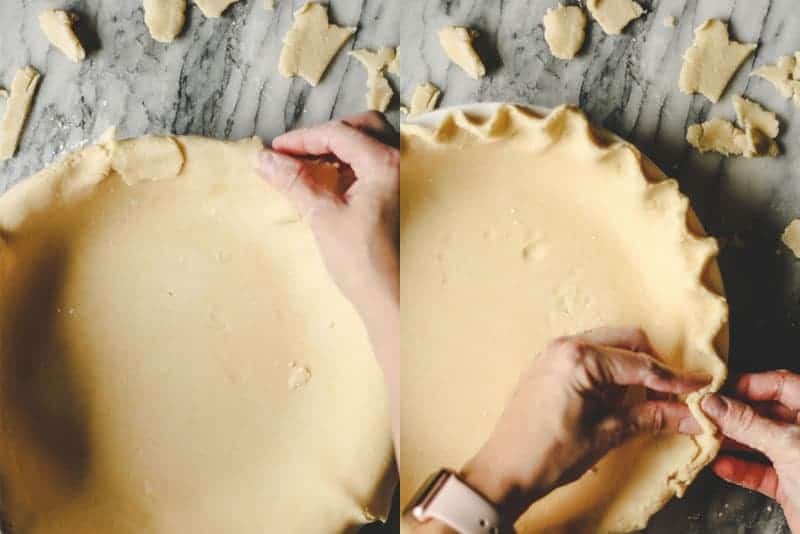 Gently pick up the rolling pin and drape the pie dough over the pie pan, making sure the crust will be centered over the pie pan. Slowly unroll the dough into the pan. Then gently press the dough down into all corners of the pan. Patch any areas that need patched. Trim the excess off the edges so there is about 1-inch overhang. For a double crust, stop here and fill the pie. Then top with the other crust in the same manner. Fold the excess dough around the edge under itself and crimp the edges of the pie as shown above. 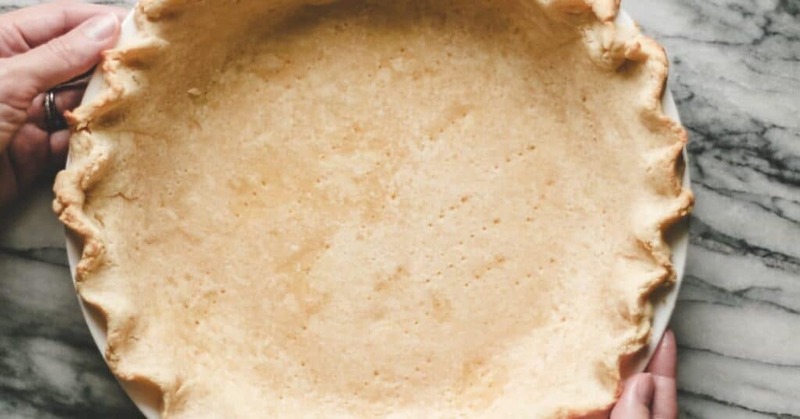 Poke holes in the bottom of the crust with a fork. Place parchment paper on top of the crust and fill with pie weights. Bake at 425 for 10-13 minutes, or until light golden brown. Fill with filling and bake according to your recipe. For a filling that will not be further baked:Remove the pie weights and parchment paper. Reduce the oven to 375°. Bake the crust an additional 8-10 minutes or until the crust is light golden brown. To make a filled, double crust pie: Bake according to your recipe. King Arthur recommends baking on the bottom rack starting at 425° for 25 minutes, reducing the heat to 350°, and then moving the pie to the center of the oven to finish baking until golden and bubbly. Practice! If you’re making the pie for a special event, make a practice pie ahead of time. This will ensure your gluten-free flour works well with this recipe since they’re all a little different. Don’t skip the xanthan gum or cornstarch. They keep the dough pliable! There’s nothing worse than your dough crumbling apart when you’re rolling it out or moving it to the pan! Avoid sticking. If the dough sticks to your surface, that’s when problems start! 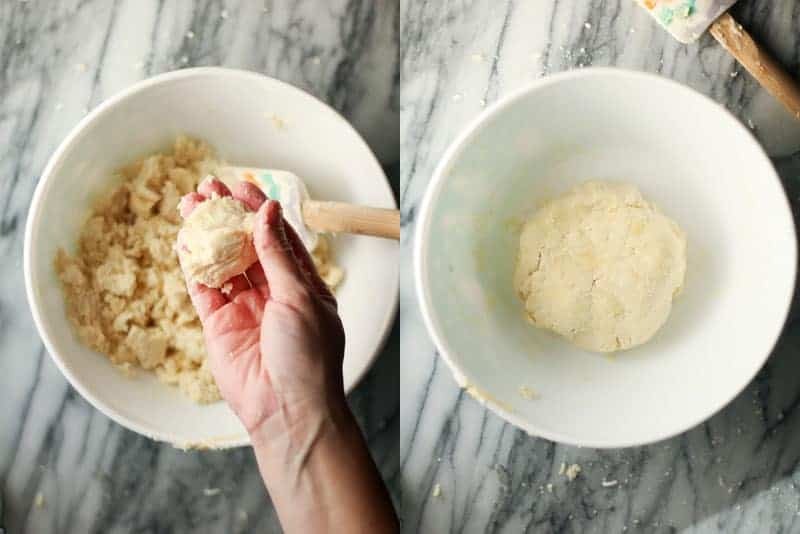 Make sure to keep the surface floured while you’re rolling out the dough. I had better success with using a well floured surface rather than trying to roll the dough out on parchment paper. Chill the dough if it’s still giving you problems. Be quick, nimble, and gentle to get the dough in the pan. You’ll have one try to get it right! But don’t worry… you can always patch any areas that crack without much harm to the final result. Embrace the more rustic look! If it doesn’t turn out as perfect as you imagined… it’s ok! It will still taste great! 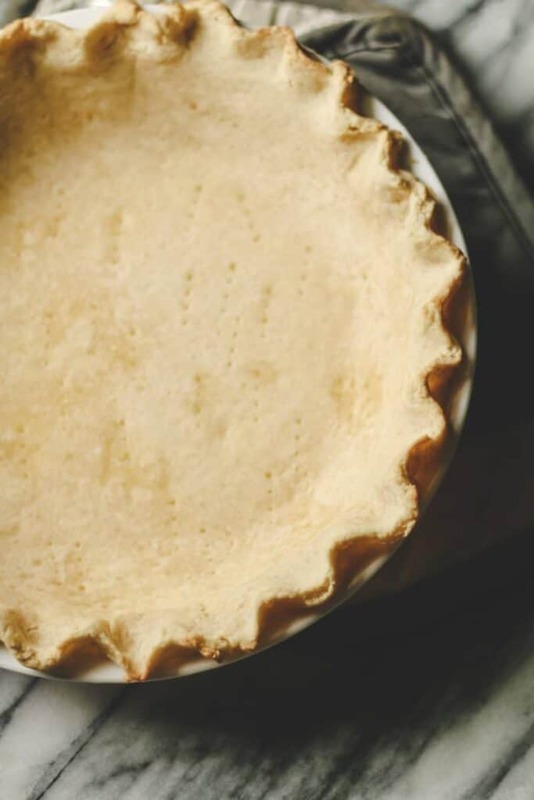 Use this no fail, gluten-free pie crust for all of your favorite pies! 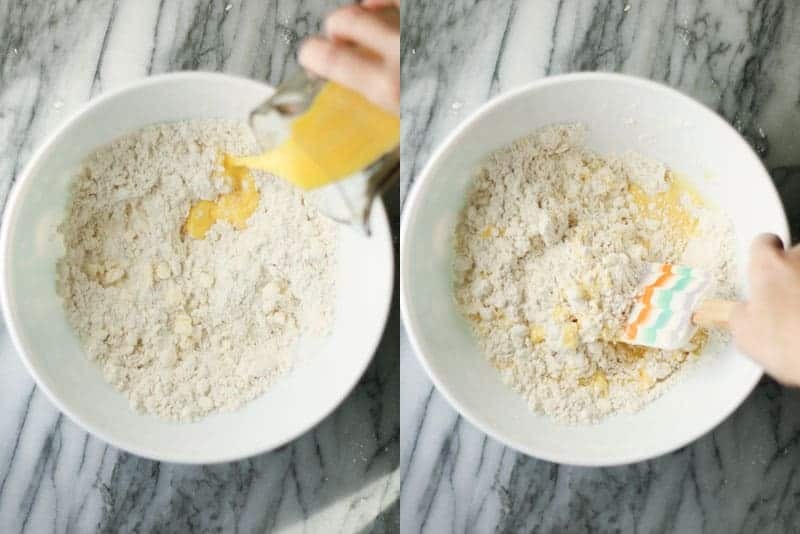 Whisk the flour, sugar, cornstarch, xanthan gum, and salt together until well combined. Add the cubed butter into the flour. 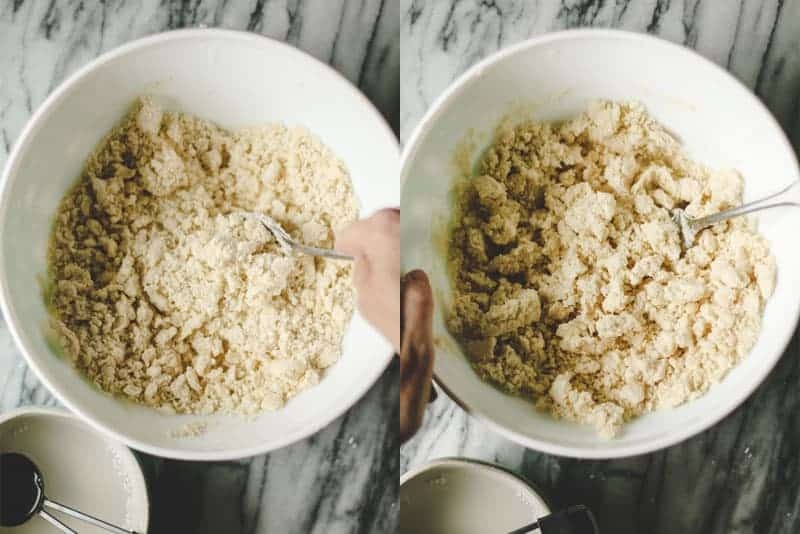 Use a pastry knife to cut the butter into the flour until mixture resembles coarse crumbs. Whisk the egg and lemon juice together. Pour into the flour mixture. Stir together with a fork or spatula until well combined. Add 1 Tablespoon of ice water and mix well. Keep adding ice water, 1 Tablespoon at a time and mixing well after each addition, until the mixture holds together. Flour the surface and rolling pin. When rolling out the dough, keep moving the pastry around to make sure it isn't sticking. Add more flour as needed, on top and under the dough, so it doesn't stick to your counter or rolling pin. 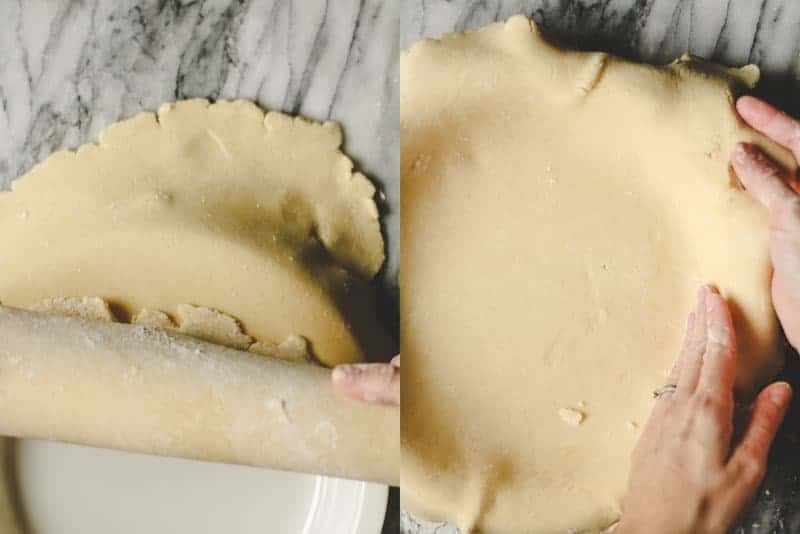 To transfer the dough to the pie pan, place your rolling pin in the center of the dough. Gently drape the dough over the pin. Patch any areas that need patched. Trim the excess off the edges so there is about 1-inch overhang. Fold the excess under and crimp the edges. Now it’s time to put the pie crust to good use! Go make this delicious Pumpkin Pecan Pie! Or use it for your favorite pie recipe! Looking for something a little non-traditional? Here’s a recipe for Apple Crisp Cups using Chebe mix for the pie dough. The crust is a little less traditional but it’s even easier to work with and also delicious!